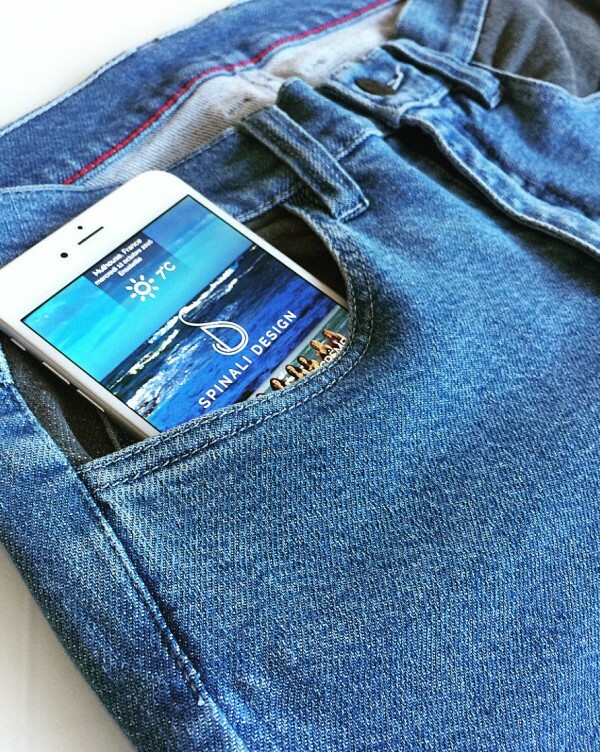 French company Spinalli Design has recently unveiled a collection of smart vibrating jeans that connect to your smartphone to provide directions to your destination. Equipped with sensors on each side, the Essential jeans vibrate every time you need to turn left or right. Recently featured at the 2016 CES show in Las Vegas, the Spinalli Design Essential jeans have been dubbed the dumbest ‘smart’ invention out of the consumer electronics show. Essentially, what it tries to do is eliminate the need to constantly check your phone when trying to use satellite navigation in an unknown neighborhood. All you need to do is pair the jeans with your smartphone, turn on the GPS feature, and let the jeans guide you to your destination. They do this via a couple of sensors located on each side, which vibrate alternatively every time you need to turn left or right. If you’re going the wrong way, both sensors vibrate at the same time. “This technology provides an easier, and above all more intuitive option to help you find your car or your meeting place, for example,” the Spinalli Design website explains. The Essential jeans have a built-in, non-removable battery that the French company claims should last four years if you use the GPS feature once a week. If you use it less than that, it should last more. But implementing this vibrating feature into jeans for the sole purpose of providing directions hardly makes any sense, which is why the French wearables company has come up with other applications as well. For example, you can set the the Essential jeans to only vibrate when you receive important messages or emails, thus removing the need to constantly check your phone and allowing you to disconnect more often. But the most interesting feature of the Essential smart jeans is also the most controversial. It’s called the ‘ping’ and it basically allows you to make another wearer’s jeans vibrate when you want to get their attention. “This is useful for when you want to discreetly attract someone’s attention, or for open offices, or for students,” Spinalli claims. I guess you can say this gives the phrase “getting into someone’s pants” a whole new meaning. If you’re interested in a pair of vibrating jeans, you’ll be glad to know that they are already on the market, and there are a varieties of styles to choose from. Spinali Design specializes in smart clothing, and has previously gotten news coverage for a bathing suit that lets the wearer know when they’ve spent too much time in the sun.